Mycophenolate versus cyclophosphamide for induction of ANCA-associated vasculitis. The lead author and presenter is Dr. Rachel B. Jones. The current standard of care is cyclophosphamide and glucocorticoids for induction of ANCA-associated vasculitis. Cyclophosphamide has numerous toxicities including malignancy, infertility, and infection. Mycophenolate mofetil (MMF) is an oral drug with significant GI side effects but an overall less worrying side effect profile. Prior to randomization, patients were allowed to get plasmapheresis and/or IV methylprednisolone. Both groups were given the induction regimen along with oral steroids for 3-6 months depending on how long it took to achieve remission. Patients randomized to cyclophosphamide received at least 6 IV doses at 15 mg/kg and could get three more monthly doses if needed. The MMF group received 2-3 g/day for 3-6 months. Following induction all patients were transitioned to azathioprine 2 mg/kg/day plus steroids. Primary outcome was remission at 6 months with successful tapering of the steroids. They outlined the statistical approach so we know what is coming, negative trial followed by statistical gymnastics. It was a non-inferiority trial. The non-inferiority margin was 12%. Results: 5 deceased in MMF treatment group, 4 in cyclophosphamide treatment group. Rescue therapy for 4 with MMF and 8 with cyclophosphamide. In both groups 54% received IV methylprednisolone and/or plasmapheresis. No further breakdown of that information was provided. The baseline creatinines were quite low: 1.3 mg/dL with MMF and 1.2 mg/dL with cyclophosphamide. Remission results: 66% with MMF and 69% with cyclophosphamide. The difference was 3% with confidence intervals of -16% to +10%, P=0.06. Dr. Jones commented that the power analysis was done with a predicted remission rate of 85-90% so this low rate was not expected and caused them to lose a lot of power. No difference in ANCA positivity or creatinine at 6 months. No statistical difference in serious adverse events. Perhaps a future study with greater power will vindicate MMF in ANCA-associated vasculitis in the future. It will be interesting to see if one arm will have more durability to their remission in future. Also, it would be interesting to see what happened to the 34 and 31% that did not achieve remission at 6 months. Was there a difference in susceptibility to further therapies based on their induction arm? Additionally, was the use of plasmapheresis and IV methylprednisolone predictive of 6-month remission? 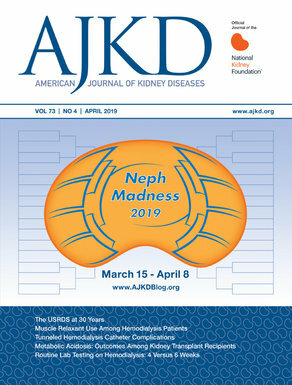 Check out all of eAJKD’s coverage of ASN’s Kidney Week here and on Twitter (@eAJKD)!